After the opening-day disappointment last weekend, all Albion fans will be hoping we bounce back against Jose Mourinho’s men on Sunday. We will all be hoping for a repeat of the magnificent team performance from last May, when the 1-0 win against Manchester United secured our Premier League survival. In our second season in the top flight back in 1980/81, we played United no less than four times. Twice in the league and twice again in the FA Cup. Three of those games came in seven days at the start of January, with two cup games and a league game at Old Trafford. In the league, we had welcomed United in November 1980. Managed by ex-Albion player Dave Sexton, they were lying in sixth place, having endured a difficult start to the season. The programme did its best to talk them up, calling them ‘arguably the most famous name in football’. This tribute to their history was spoilt slightly by the mention of Garry Birtles, ‘one of Britain’s most expensive players’. It’s safe to say he didn’t exactly set the Old Trafford pitch alight in his time there! Elsewhere in the programme, we saw the start of what was to become a very popular feature over the years. The ‘Introducing…….’ column interviewed a different player each week, delving into their football background and (hopefully) un-earthing some random facts about their personal life. For the United game, the willing participant was centre-half Steve Foster. Signed from Portsmouth in the summer of 1979, he had missed just one game since his debut against Cambridge United. Away from the football, we learn that he is trying to sell his flat, just off New Church Road, not far from the Goldstone. He is a ‘dab hand on the pool table’ and following the purchase of a new car, ‘enjoys driving fast’. He ‘is not an ardent fan of popular music, but does enjoy television’. Riveting stuff and the fans lapped up this information about their heroes. On the field, United were too strong for us on the day, winning 4-1. The crowd of over 23,000 was expectant, but goals from Sammy McIlroy, Mike Duxbury and Joe Jordan gave United a 3-0 lead at half-time. Manager Alan Mullery tore into the players at the interval and we were much improved in the second half. Ex-United striker Andy Ritchie pulled one back after 68 minutes, his first goal for six months. Apart from the goal, Foster missed a great headed chance and Gary Stevens came off second best in a one-on-one with United goalkeeper Gary Bailey. The fightback never really materialised however, and United rubbed salt in our wounds with a fourth goal, again scored by Jordan. Big-money signing Birtles had another quiet game, being replaced by defender Ashley Grimes. Not a good day at the office for Albion, but that defeat was followed by a run of four wins in five games in December. 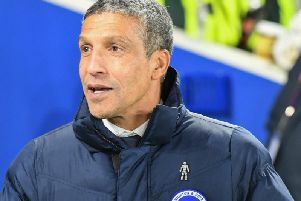 Win, lose or draw on Sunday, it’s just two games into a long season and Chris Hughton’s men will be battling all the way.